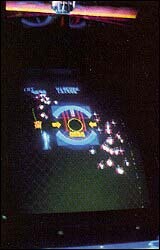 In the movie version of Tron, the main character, Flynn, is sucked into an arcade game programmed to eliminate him. You see, Flynn is a computer genius and game lord on the side (or is it the other way around?). He believes that the company he worked for is now marketing his video games without his permission. While doing some clandestine reprogramming of the corporation's computer, he is dematerialized and thrown into the circuitry of the computer itself. Inside the computer, he becomes his own program. He is sentenced to die fighting on the video game grid. Luckily, our hero is aided by Tron, a program that fights for the Users. Tron and Flynn team up against the Master Control Program (MCP) and attempt to break out of their parallel computer world. It's a classic battle of Good rebelling against an oppressive establishment. 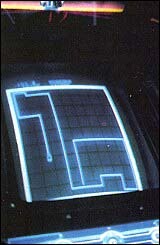 The game of Tron is composed of four separate games based on certain memorable sequences from the movie: the MCP cone, Tank Maze, I/0 Tower, and Light Cycles. The MCP sequence is a warped variation of the classic Breakout. The Tank Maze is a tank battle program with flashier packaging. Doing battle with the grid bugs of the the I/0 Tower is a free style shoot-'em-up, and the Light Cycle game is a fast-paced version of the old game Surround. It has been reported that the movie Tron did not do as well as expected in the theaters last summer. On the other hand, a recent poll conducted by Playmeter magazine ranks Tron as the second most popular arcade game in the industry. Not bad for a game based on a less-than-successful movie and four hackneyed game concepts. In all but the Light Cycle board, you use the rotary dial to aim your weapons. The luminescent blue joystick has a firing button built into the handle and is used to control the movement of your character, the User. Tron is not difficult to master once you understand some of the basic concepts behind the game play. The Light Cycles and Tank Maze present the biggest problem for most players, so don't feel bad if you find yourself losing men on these boards. The trick to beating the yellow light cycles is to find patterns that trap them inside your blue trail. Rather than waste quarters devising your own patterns, watch what works for other players on the machine. A pattern that works once on a certain level will always work on that level. The object of this game is to carve away a large portion of the board for yourself and slowly eat it up. The enemy doesn't monitor its consumption of the maze as carefully as it should, thus it is doomed to exhaust its share of space fairly quickly. A good idea is to start off this board with the trigger of the joystick pressed to give you maximum speed. Quickly turn to the left and then go to the top of the screen. Cut right, wrapping around where the enemy cycles began. By entrapping the enemies in this way, you force them into a very limited amount of space which they quickly use up. You will never encounter more than three enemy light cycles on the same board. This section of Tron does get harder as the game progresses, because the enemy becomes faster and more evasive. To do well here, you must know that the enemy tanks can fire only on the continuous blue trails that line the floor of the maze. Tanks cannot shoot through the pink diamond in the center of the screen, but you can. You can also bank your shots off the walls of the maze. This is your big advantage in defeating the tanks. The pink diamond is a teleport station that should be entered only to escape certain death. When you enter the diamond, you are transported to a random point in the maze, thus disorienting you for a second-long enough to be blown to bits. To destroy a tank, you must hit it three times with your cannon blasts. To lose a tank yourself, you need be shot only once. If you score a hit on a tank, it is scarred with a red flame. The first time you encounter a tank, you should have no problem disposing of it. The second time you enter the Tank Maze, there will be three tanks. Obviously this will be a bit harder. You must learn to bank shots successfully to eliminate tanks without exposing yourself. If you are fighting more than one tank, position yourself at one end of a corridor with an escape route to one side. Before the enemy tank enters the same hallway, fire shots in its direction, and then change position. If your timing is good, you should be able to score two hits before the tank can get a good shot at you. Finish off the wounded tank with one final shot and move on to your next target. Remember, a shot from a tank remains lethal even after the tank it was fired from has been destroyed. Don't fall prey to the "dying shot syndrome. " Nothing is more disappointing than being killed just as you finish off the last tank. 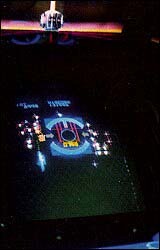 Your opponents on this screen are the grid bugs and time. When the action starts, the counter below the green circle begins counting down. When it drops below 100, a loud warning sounds. If the counter reaches zero, you die. The grid bugs are fairly easy to defeat. The trick is to get close to a batch of them and start firing like crazy. Blast away at the clusters of bugs before you start exterminating with discretion. When you see that you have a clear path to one of the side doors to the tower, move up to the door, but do not enter yet. Keep on firing at the bugs, even if they don't pose a threat to you. Killing bugs on the second and third rounds provides for a large increase in your score without risking your life. Wait until the warning buzzer goes off before you enter the tower, otherwise you will forfeit great point scoring opportunities. This screen is really a strange variation on Atari's classic game, Breakout. 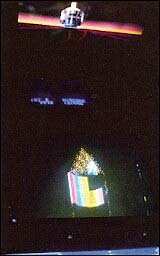 The object here is to enter the MCP--the fuzzy dots at the top of the cone. First off, move up as close as you can to the revolving blocks. Fire your frisbees as fast as you can, while moving down with the descent of the cylinder. Attempt to blow open a diagonal hole in the revolving cone. Continue to fire on this diagonal and you will slowly destroy every block. When all the blocks are gone, you automatically slide up into the MCP. You are awarded 1000 points for entering the MCP and an additional 1000 points for destroying all of the colored blocks. Even though the speed of the revolving cone is increased, it is still possible to eliminate all of the blocks on the second round. Follow the same basic pattern for clearing away as many bricks as you can until you realize you can't move down any further. Quickly make a dash for the MCP, but stop short of entering it. Point your arm down at the bricks and continue to fire at the ones below your feet. When its time comes, the MCP will have moved down as far as it will go and you will be forced to enter it. The thing that takes most players by surprise on the third round is that the cylinder is spinning counterclockwise, instead of clockwise as in the preceding rounds. Just knowing this ahead of time will help. Disregard the tips given for the earlier MCP rounds. The most important thing here is to punch a hole in the bricks quickly and move to the MCP as soon as you can. When you are passing through the blocks, don't forget to move with the flow.